GERALD SAVINE NDD, GRA. Born in London in October 1945 - Attended the Harrow School of Art from 1959-1965. Originally working in the creative departments of advertising agencies in London, Bristol and Cheltenham. For over 25 years Gerald has worked as an independent Art Director, Graphic Designer and Illustrator producing work for various national and international companies and museums. 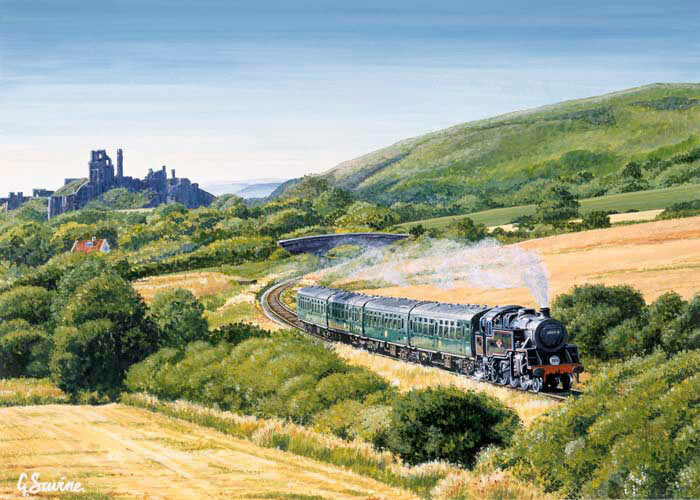 About twelve years ago Gerald joined the Swiss Railway Society and became the organiser for the West Midlands Area Group. 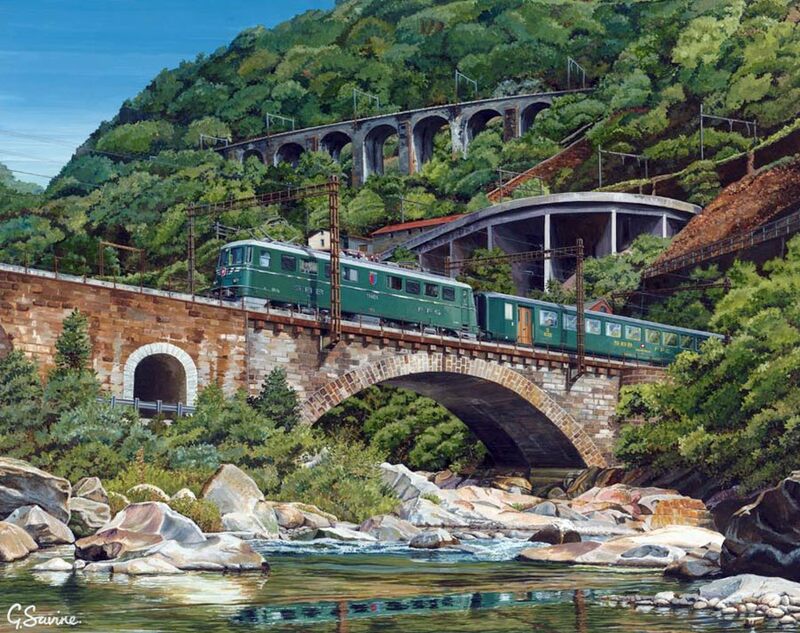 Through an interest in all the railways, lake steamers and the fabulous countryside of Switzerland, he decided to turn his painting skills to producing an ongoing series of Swiss based paintings. 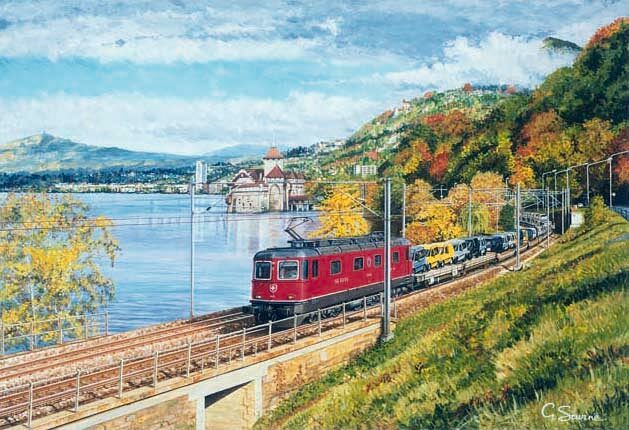 Gerald's work has been exhibited at the Swiss National Transport Museum - The Verkehrshaus in Luzern and exhibits regularly at specialist exhibitions from Hampshire to Yorkshire. 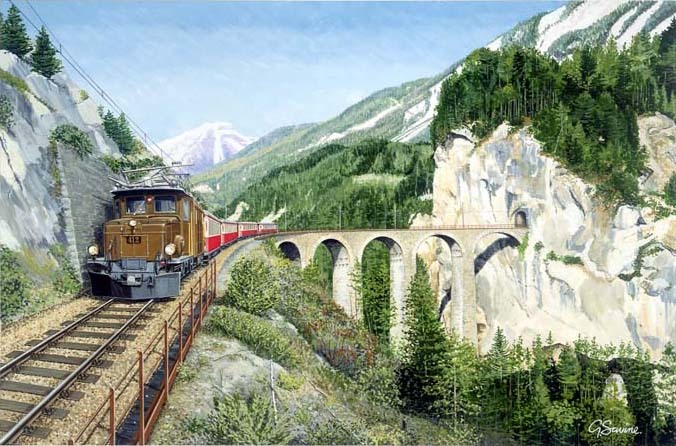 The Landwasser Viaduct is a single track six-arched curved limestone railway viaduct. It spans the Landwasser River between Schmitten and Filisur, in the Canton of Graubunden, Switzerland. 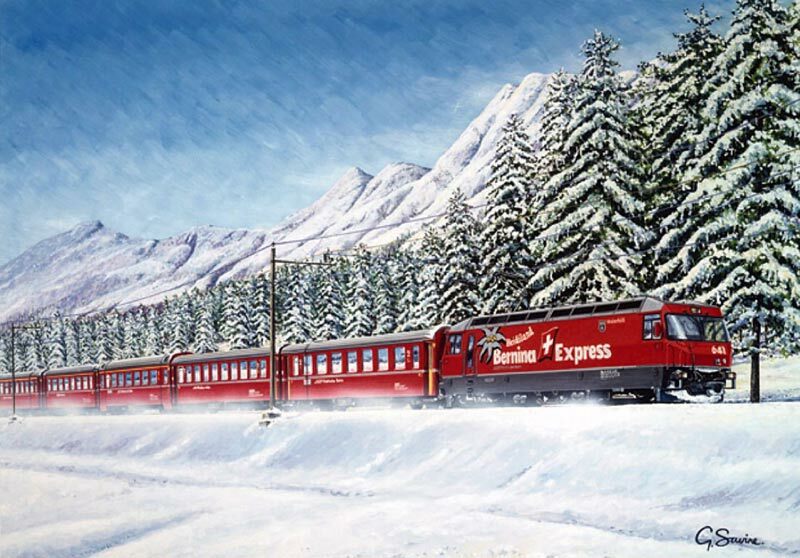 RhB GE4/4111 641 'Maienfeld' heads the Bernina Express. MOB FZe 6/6 2001 on the Golden Mountain Pullman Express at Chateau d'Oex. SBB Re 6/6 11672 'Balerna' passing Chateau de Chillon, Lac Leman. 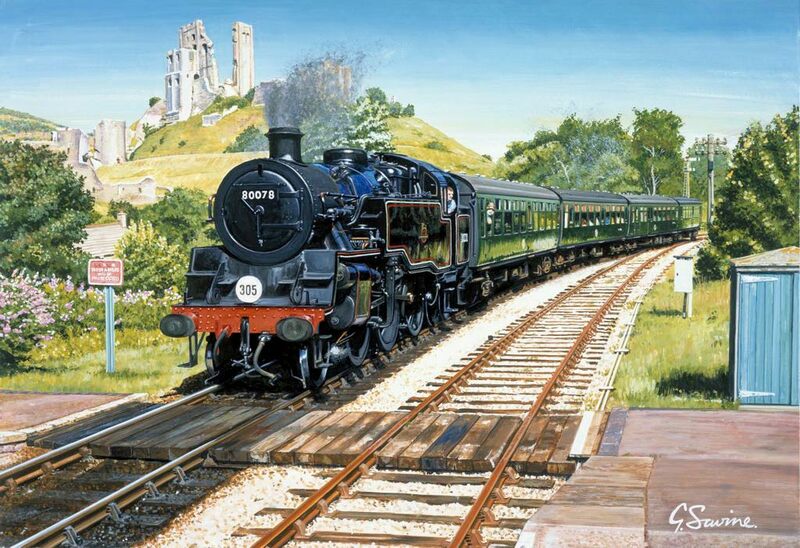 British Railways standard class 4 tank locomotive No.80078 leaves Corfe Castle station on the Swanage Railway in the 1990's. 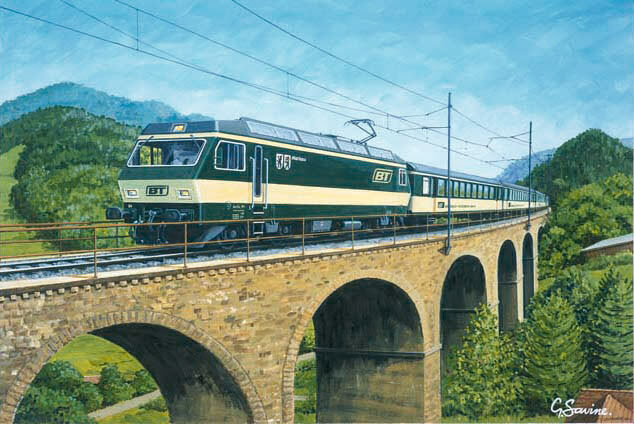 Bodensee Toggenburg Re4/4 94 'Herisau' crosses Waldbach Viaduct. 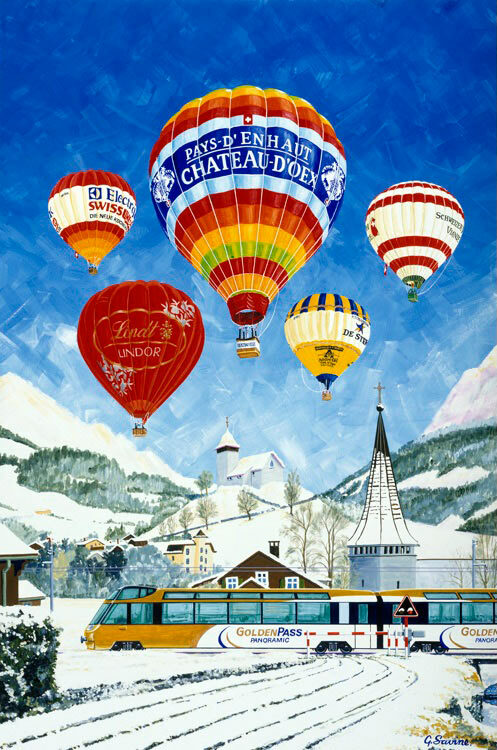 Chateau d'Oex Balloon Festival and the 'Golden Pass Panoramic Express'. Zurich Hauptbahnhof is the largest railway station in Switzerland. 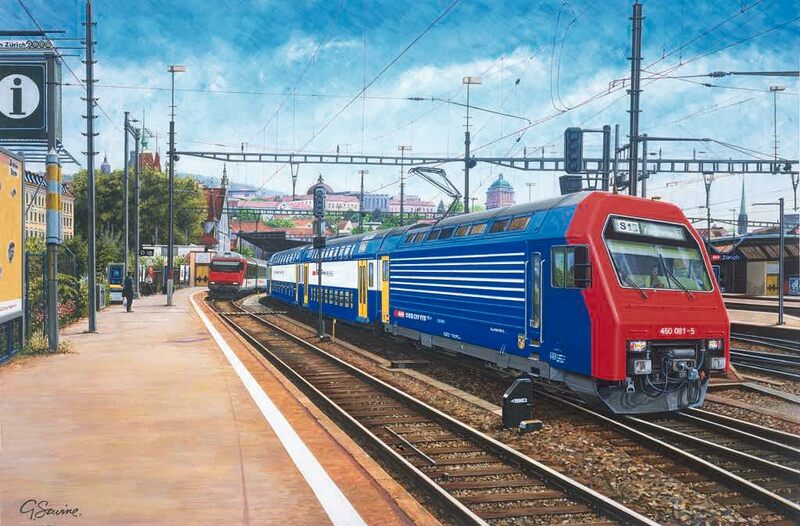 Zurich is a major railway hub, with services to and from across Switzerland and neighbouring European countries such as Germany, Italy, Austria and France. The station was originally constructed as the terminus of the Spanisch Brotli Bahn, the first railway built completely within Switzerland. Serving up to 2,915 trains per day, Zurich HB is one of the busiest railway stations in the world. 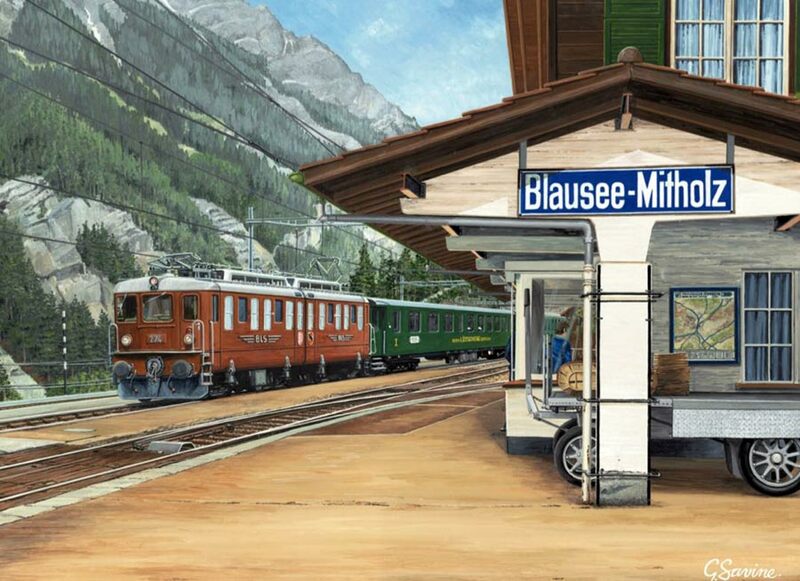 Classic electric loco BLS Ae 4/4 heads a train at Blausee-Mitholz station Switzerland. The 'Spiral' opened in 1882, following completion of the Gotthard Tunnel. 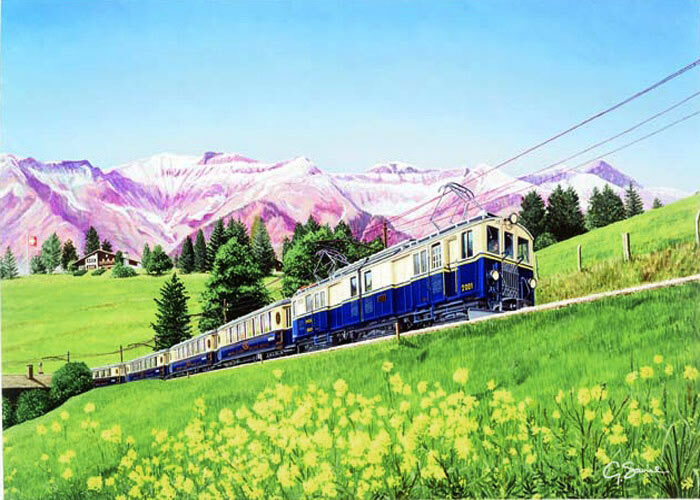 The line was incorporated into the Swiss Federal Railways in 1909, being electrified in 1922.